Democracy's Non-Human and Non-Living "Others"
Organised by Tehseen Noorani, Rachel Liebert, Julian Brigstocke. 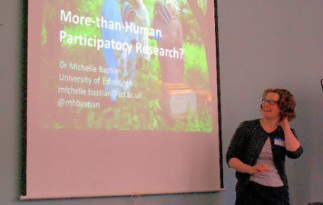 This international symposium explored the roles in participatory democracy of forms of agency that exceed the boundaries of the conventional individual subject, including the non-human and the non-living. Plenary discussants were Jane Bennett, Maria Torre, Rachel Liebert, and Julian Brigstocke. See a blog entry on the workshop here. Listen to recordings of the workshop here. Questions of empowerment and voice are central to all forms of participatory politics and research. But what happens when we attune ourselves to forms of agency that exceed the boundaries of the conventional liberal subject? Recent materialist approaches to agency and subjectivity have done much to reconfigure concepts of political community in ways that recognize the active political agency of animals, ecosystems, intra-psychic and trans-psychic entities, the dead, the yet-to-be-born, and objects, technologies and laws (Bennett, 2010; Honig, 2012; Latour & Weibel, 2005). An increasing number of aesthetic practices, similarly, are reconfiguring the arts as ‘co-collaborations’ between human and non-human agency (Barrett & Bolt, 2013; Morton, 2013). How, then, are we to listen to political actors that do not possess a conventional ‘voice’? And what might the role of ‘more-than-human’ agencies be in creating more egalitarian forms of democratic authority (Whatmore, 2002)? The workshop brought together diverse perspectives on 'worldings' in which distinct subjects, objects and publics are brought into novel alignments (Ranciere, 2004; Barad; 2007). 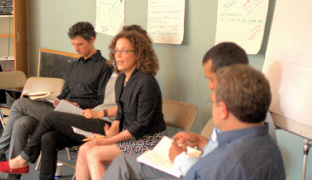 The workshop was part of a collaboration between Plymouth University, CUNY’s Public Science Project, and Johns Hopkins University, and was facilitated by the Authority Research Network.